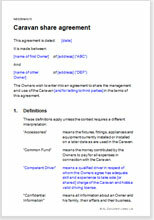 Comprehensive agreement of the terms and conditions for the shared (fractional) ownership of a caravan. This is a comprehensive document that deals with the terms of ownership, by two or more parties. The parties may be couples, relatives, friends or unknown to each other. The document deals extensively with issues like ownership rights of the parties which may be in equal or unequal proportion. It also includes a time table and notes on the manner of sharing the use of the caravan and the responsibilities of each party in maintenance and upkeep of the caravan. Additionally, there are paragraphs on various exit strategies. It provides for exclusive terms to ensure minimum disruption to each party if the others want to sell their share. It also provides for proper management even where the parties can not decide by mutual agreement. Note on legal ownership: Even if ownership of your caravan is registered with some organisation, the particulars will not record the shares in which the touring caravan is held. So if you own 60% and I own 40% we have to record that in some other document. If we do not do so, “the Law” will assume we own in the shares in which we contributed to the purchase price. This may or may not be the same thing. These Net Lawman agreements specifically record the shares. They also record shares which may be owned by someone who is not a registered owner. Such an interest is called a beneficial interest. Terms of beneficial interest: how will the caravan be owned?